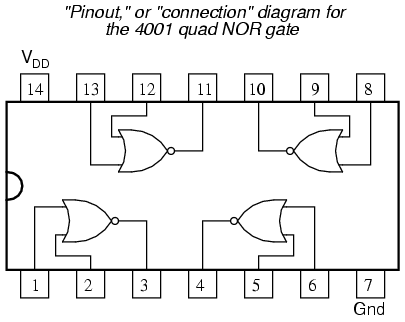 Lessons In Electric Circuits, Volume 4, chapter 4: "Switches"
The model 4017 integrated circuit is a CMOS counter with ten output terminals. One of these ten terminals will be in a "high" state at any given time, with all others being "low," giving a "one-of-ten" output sequence. If low-to-high voltage pulses are applied to the "clock" (Clk) terminal of the 4017, it will increment its count, forcing the next output into a "high" state. With a 555 timer connected as an astable multivibrator (oscillator) of low frequency, the 4017 will cycle through its ten-count sequence, lighting up each LED, one at a time, and "recycling" back to the first LED. The result is a visually pleasing sequence of flashing lights. Feel free to experiment with resistor and capacitor values on the 555 timer to create different flash rates. 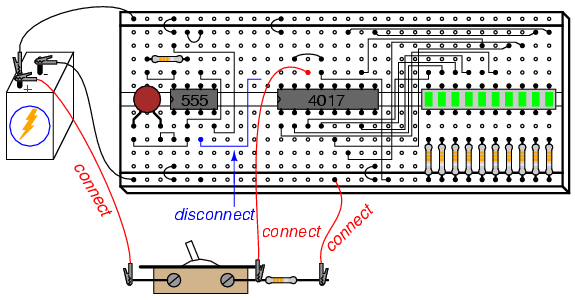 Try disconnecting the jumper wire leading from the 4017's "Clock" terminal (pin #14) to the 555's "Output" terminal (pin #3) where it connects to the 555 timer chip, and hold its end in your hand. 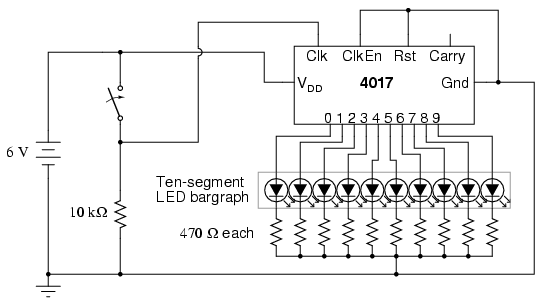 If there is sufficient 60 Hz power-line "noise" around you, the 4017 will detect it as a fast clock signal, causing the LEDs to blink very rapidly. Two terminals on the 4017 chip, "Reset" and "Clock Enable," are maintained in a "low" state by means of a connection to the negative side of the battery (ground). This is necessary if the chip is to count freely. If the "Reset" terminal is made "high," the 4017's output will be reset back to 0 (pin #3 "high," all other output pins "low"). 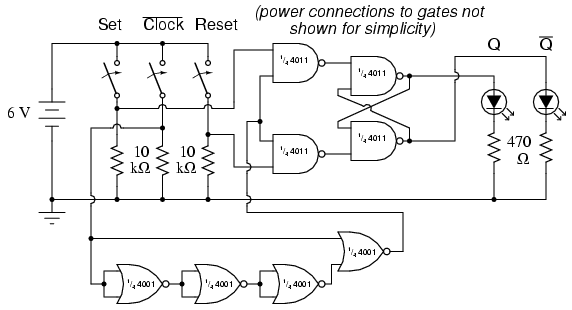 If the "Clock Enable" is made "high," the chip will stop responding to the clock signal and pause in its counting sequence. Counters such as the 4017 may be used as digital frequency dividers, to take a clock signal and produce a pulse occurring at some integer factor of the clock frequency. For example, if the clock signal from the 555 timer is 200 Hz, and the 4017 is configured for a full-count sequence (the "Reset" terminal connected to ground, giving a full, ten-step count), a signal with a period ten times as long (20 Hz) will be present at any of the 4017's output terminals. In other words, each output terminal will cycle once for every ten cycles of the clock signal: a frequency ten times as slow. 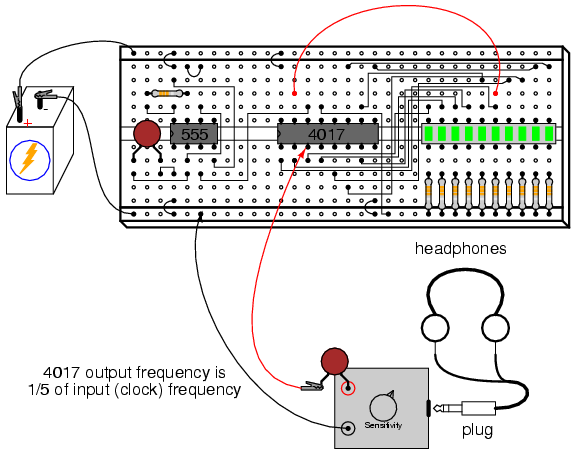 In fact, knowing this mathematical relationship between clicks heard in the headphone and the clock frequency allows us to measure the clock frequency to a fair degree of precision. Using a stopwatch or other timepiece, count the number of clicks heard in one full minute while connected to the 4017's "0" output. Using a 1 MΩ resistor and 0.1 µF capacitor in the 555 timing circuit, and a power supply voltage of 13 volts (instead of 6), I counted 79 clicks in one minute from my circuit. Your circuit may produce slightly different results. Multiply the number of pulses counted at the "0" output by 10 to obtain the number of cycles produced by the 555 timer during that same time (my circuit: 79 x 10 = 790 cycles). 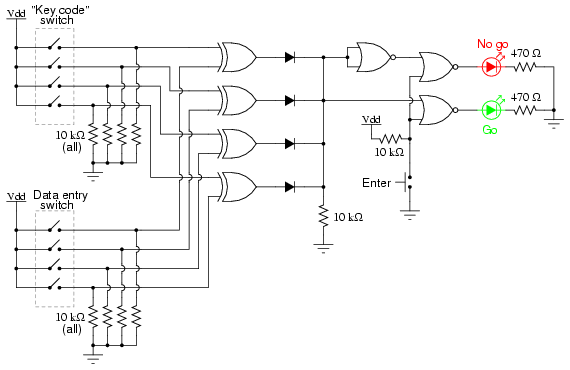 Divide this number by 60 to obtain the number of timer cycles elapsed in each second (my circuit: 790/60 = 13.17). This final figure is the clock frequency in Hz. Counting the number of clicks heard in one minute again, you should obtain a number approximately twice as large as what was counted with the 4017 configured for a 1/10 ratio, because 1/5 is twice as large a ratio as 1/10. If you do not obtain a count that is exactly twice what you obtained before, it is because of error inherent to the method of counting cycles: coordinating your sense of hearing with the display of a stopwatch or other time-keeping device. 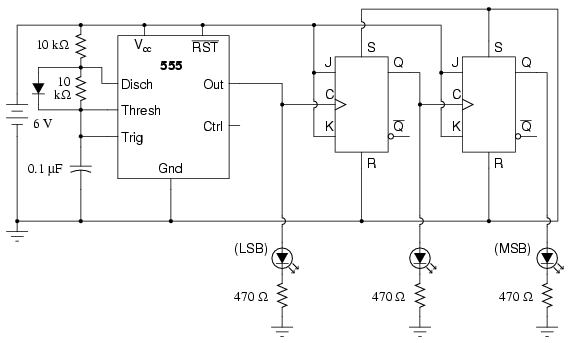 Try replacing the 1 MΩ timing resistor in the 555 circuit with one of greatly lesser value, such as 10 kΩ. This will increase the clock frequency driving the 4017 chip. 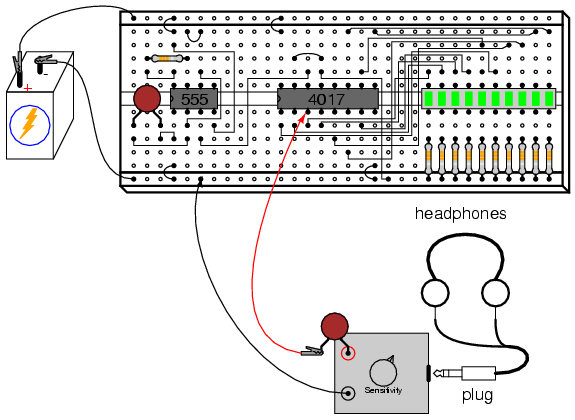 Use the audio detector to listen to the divided frequency at pin #3 of the 4017, noting the different tones produced as you move the "Reset" jumper wire to different outputs, creating different frequency division ratios. See if you can produce octaves by dividing the original frequency by 2, then by 4, and then by 8 (each descending octave represents one-half the previous frequency). Octaves are readily distinguished from other divided frequencies by their similar pitches to the original tone. The purpose of a "pulldown" resistor is to provide a definite "low" logic state when the switch contact opens. Without this resistor in place, the 4017's "Clock" input wire would be floating whenever the switch contact was opened, leaving it susceptible to interference from stray static voltages or electrical "noise," either one capable of making the 4017 count randomly. With the pulldown resistor in place, the 4017's "Clock" input will have a definite, albeit resistive, connection to ground, providing a stable "low" logic state that precludes any interference from static electricity or "noise" coupled from nearby AC circuit wiring. Actuate the switch on and off, noting the action of the LEDs. With each off-to-on switch transition, the 4017 should increment once in its count. However, you may notice some strange behavior: sometimes, the LED sequence will "skip" one or even several steps with a single switch closure. Why is this? It is due to very rapid, mechanical "bouncing" of the switch contacts. When two metallic contacts are brought together rapidly as does happen inside most switches, there will be an elastic collision. This collision results in the contacts making and breaking very rapidly as they "bounce" off one another. 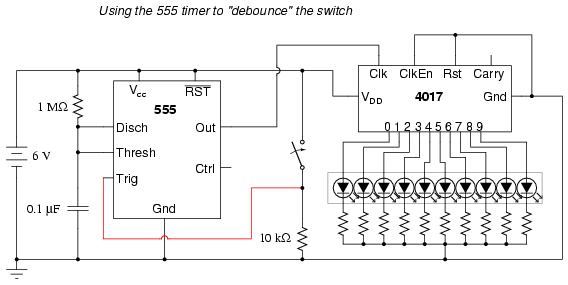 Normally, this "bouncing" is much to rapid for you to see its effects, but in a digital circuit such as this where the counter chip is able to respond to very quick clock pulses, these "bounces" are interpreted as distinct clock signals, and the count incremented accordingly. One way to combat this problem is to use a timing circuit to produce a single pulse for any number of input pulse signals received within a short amount of time. The circuit is called a monostable multivibrator, and any technique eliminating the false pulses caused by switch contact "bounce" is called debouncing. Please note that since we are using the 555 once again to provide a clock signal to the 4017, we must re-connect pin #3 of the 555 chip to pin #14 of the 4017 chip! Also, if you have altered the values of the resistor or capacitor in the 555 timer circuit, you should return to the original 1 MΩ and 0.1 µF components. Actuate the switch again and note the counting behavior of the 4017. There should be no more "skipped" counts as there were before, because the 555 timer outputs a single, crisp pulse for every on-to-off actuation (notice the inversion of operation here!) of the switch. 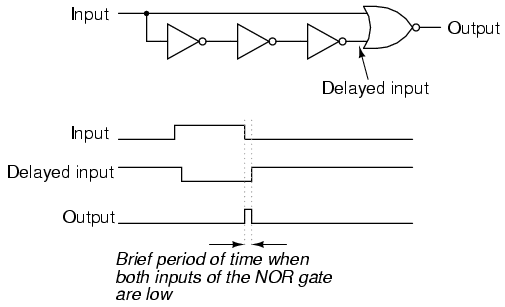 It is important that the timing of the 555 circuit be appropriate: the time to charge the capacitor should be longer than the "settling" period of the switch (the time required for the contacts to stop bouncing), but not so long that the timer would "miss" a rapid sequence of switch actuations, if they were to occur. Caution! The 4511 IC is CMOS, and therefore sensitive to static electricity! Lessons In Electric Circuits, Volume 4, chapter 9: "Combinational Logic Functions"
This experiment is more of an introduction to the 4511 decoder/display driver IC than it is a lesson in how to "build up" a digital function from lower-level components. 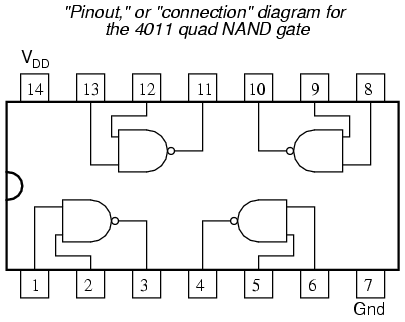 Since 7-segment displays are very common components of digital devices, it is good to be familiar with the "driving" circuits behind them, and the 4511 is a good example of a typical driver IC. Its operating principle is to input a four-bit BCD (Binary-Coded Decimal) value, and energize the proper output lines to form the corresponding decimal digit on the 7-segment LED display. The BCD inputs are designated A, B, C, and D in order from least-significant to most-significant. Outputs are labeled a, b, c, d, e, f, and g, each letter corresponding to a standardized segment designation for 7-segment displays. Of course, since each LED segment requires its own dropping resistor, we must use seven 470 Ω resistors placed in series between the 4511's output terminals and the corresponding terminals of the display unit. Most 7-segment displays also provide for a decimal point (sometimes two! ), a separate LED and terminal designated for its operation. All LEDs inside the display unit are made common to each other on one side, either cathode or anode. 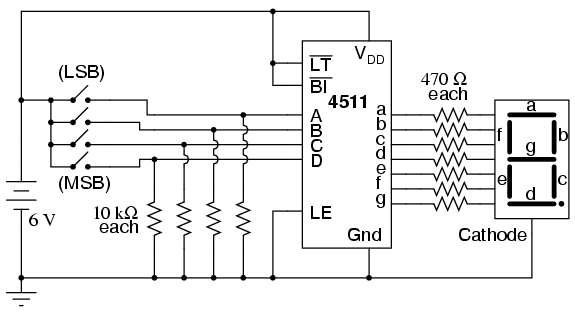 The 4511 display driver IC requires a common-cathode 7-segment display unit, and so that is what is used here. 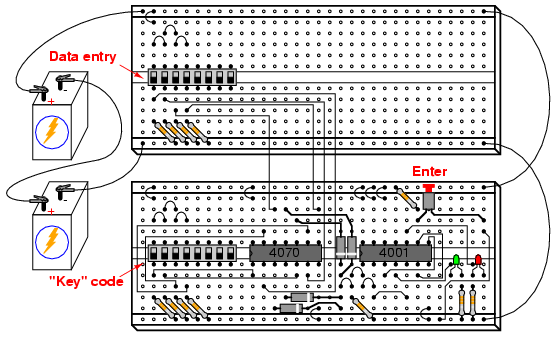 After building the circuit and applying power, operate the four switches in a binary counting sequence (0000 to 1111), noting the 7-segment display. A 0000 input should result in a decimal "0" display, a 0001 input should result in a decimal "1" display, and so on through 1001 (decimal "9"). What happens for the binary numbers 1010 (10) through 1111 (15)? Read the datasheet on the 4511 IC and see what the manufacturer specifies for operation above an input value of 9. In the BCD code, there is no real meaning for 1010, 1011, 1100, 1101, 1110, or 1111. These are binary values beyond the range of a single decimal digit, and so have no function in a BCD system. The 4511 IC is built to recognize this, and output (or not output!) accordingly. Three inputs on the 4511 chip have been permanently connected to either Vdd or ground: the "Lamp Test," "Blanking Input," and "Latch Enable." To learn what these inputs do, remove the short jumpers connecting them to either power supply rail (one at a time! ), and replace the short jumper with a longer one that can reach the other power supply rail. For example, remove the short jumper connecting the "Latch Enable" input (pin #5) to ground, and replace it with a long jumper wire that can reach all the way to the Vdd power supply rail. Experiment with making this input "high" and "low," observing the results on the 7-segment display as you alter the BCD code with the four input switches. After you've learned what the input's function is, connect it to the power supply rail enabling normal operation, and proceed to experiment with the next input (either "Lamp Test" or "Blanking Input"). Once again, the manufacturer's datasheet will be informative as to the purpose of each of these three inputs. Note that the "Lamp Test" (LT) and "Blanking Input" (BI) input labels are written with boolean complementation bars over the abbreviations. Bar symbols designate these inputs as active-low, meaning that you must make each one "low" in order to invoke its particular function. Making an active-low input "high" places that particular input into a "passive" state where its function will not be invoked. 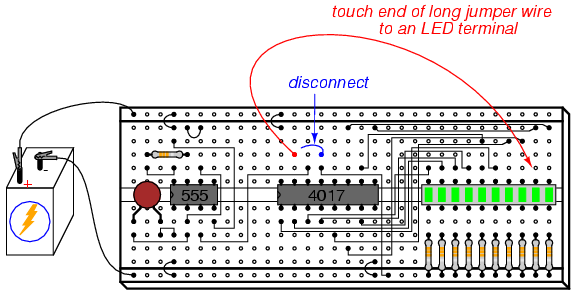 Conversely, the "Latch Enable" (LE) input has no complementation bar written over its abbreviation, and correspondingly it is shown connected to ground ("low") in the schematic so as to not invoke that function. The "Latch Enable" input is an active-high input, which means it must be made "high" (connected to Vdd) in order to invoke its function.